They wheeled into Leeds every year, the Gallic cyclists, jerseys striped rather than yellow. 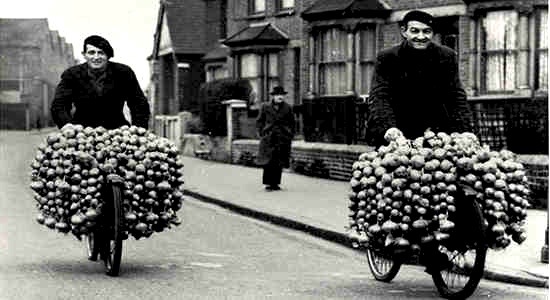 A seasonal appearance, fresh onions slung from black handlebars. One year the migration stopped, a supermarket making them as superfluous as my recently discarded rear wheel stabilisers. Years passed, tears and layers came and went, only some caused by fresh onions. I lived in the same house for more than twenty years, a city terrace. The front door opened straight onto the road, the back door onto the yard. At the beginning of each day I picked my bike from the yard, through the kitchen, along the hall, out onto the street. In the evening the routine was reversed. Time came to move on, the house now so full I could hardly push my bike along the hall. The estate agent arranged to take photographs of my house. I assumed they would want pictures with a 4 x 4 or convertible in front but when I saw the photographs online there were the pictures with my bike propped against the For Sale sign. Perhaps that was the USP. The house sold so fast I wasn’t ready for my next step. I’d need to be out in weeks. I began decluttering, wheeling my bike to charity shops panniered with old books and vinyl records. The ride back was always easier. On the last day I carried my bike from the desolate yard, through the hall out on the street, riding to the next place. Hanging from the handlebars, a kettle, a pan, some vegetables to make tea the first new evening.